Dubai, UAE, July 23, 2018: Pearl’s Vignes de France, from the heart of the vineyards in Burgundy, is launching a premium grape based sparkling beverage made with pure grape juice and infused with carbon bubbles. Pearl’s is a sparkling 100% Natural, Alcohol Free and Halal Certified drink, a new alternative to the alcoholic bubbly beverages, Pearl’s is 100% halal. Designed for the Middle East and in line with cultural tastes and preferences, the name Pearl’s is in honor of the region’s historical pearl trading background and the packaging is designed in white as a symbol for purity and gold to portray the true splendor of the product. Pearl's brings French elegance and lifestyle to consumers in the Middle East who have a distinctive appreciation and love of luxury and high-quality offerings. 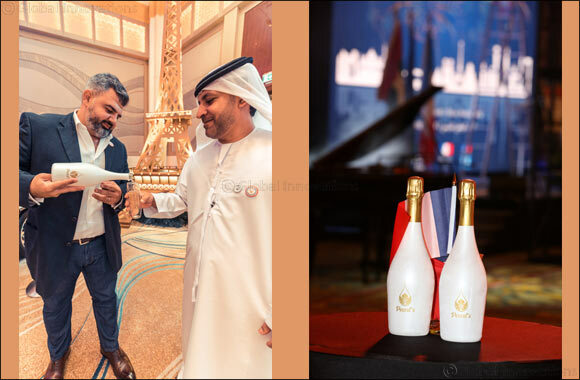 “We are very excited to launch Pearl’s on the occasion of the French National Day on July 14th in partnership and hosted by the French Embassy in Abu Dhabi and the Consulate General of France in Dubai. This is a great opportunity to introduce this unique sparkling grape beverage which is a reflection of French indulgence and heritage, linking French vines to regional consumers,” explained Alexandre Mensuelle, founder of Pearl’s. Created with an assortment of the finest grape selection of Chardonnay & Folle Blanche, picked exclusively from the French vineyard, Pearl’s taste is the perfect balance of a relatively dry, medium-bodied white grape emanating fresh aromas with crisp notes of fruity flavors. Pearl’s works in close collaboration with the vineyard’s growers to ensure that the highest-quality of grapes are selected. With only one production per year and each bottle having a biennial shelf life, Pearl's crystallizes the great skills and mastery of French vineyards to produce a beverage that meets the codes of luxury and celebration whilst adhering to sacred religious commitments. Created to celebrate key moments during life events, Pearl’s is a prestigious and festive drink that is made with natural products, using traditional methods.